(CNSNews.com) - Real state and local income, sales and property taxes all hit records in 2017, according to data released this week by the Census Bureau. State and local governments collected a record $404,509,000,000 in individual income taxes in 2017, according to the Census Bureau. Before 2017, the greatest level of individual income tax revenues collected by state and local governments occurred in 2015, when those governments collected $399,933,270,000 in individual income taxes (in constant 2017 dollars converted using the Bureau of Labor Statistics inflation calculator). State and local governments also collected a record $386,153,000,000 in general sales and gross receipts taxes in 2017. 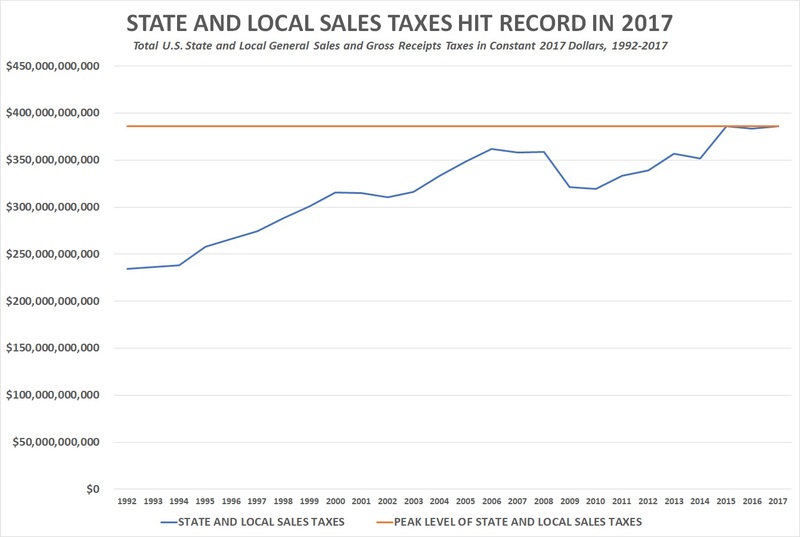 Prior to that, the largest state and local general sales and gross receipt tax collections took place in 2015, when state and local governments collected $385,904,260,000 in those taxes (in constant 2017 dollars). At the same time, state and local governments collected a record $573,064,000,000 in property taxes in 2017. Before 2017, the largest property tax collections took place in 2016, when state and local governments collected $551,936,350,000 in property taxes (in constant 2017 dollars). 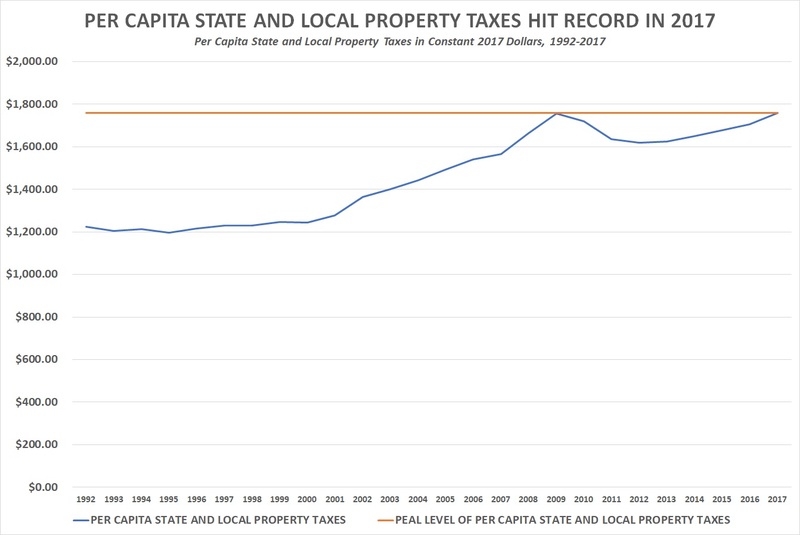 Property taxes also hit a record in 2017 on a per capita basis. During the year, the record $573,064,000,000 in property taxes that state and local governments collected from property owners equaled $1,759 per each of the 325,719,178 men, women and children in the United States. 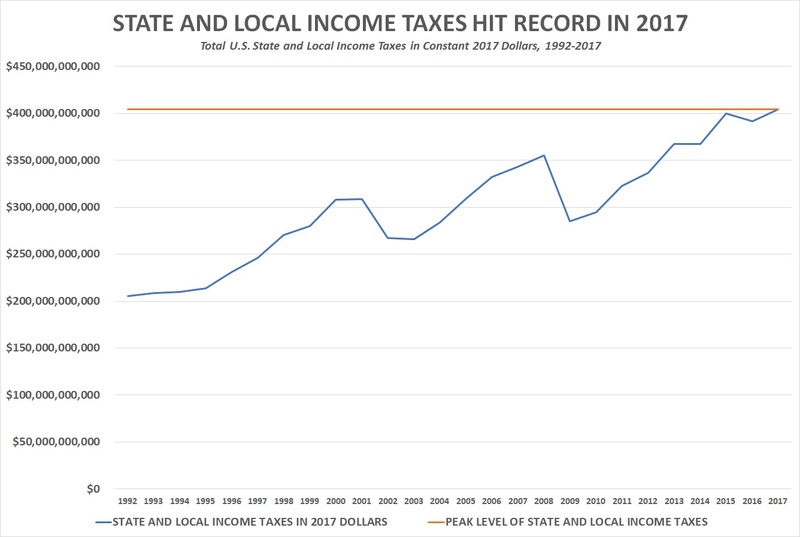 Per capita state and local income taxes peaked in 2015 at approximately $1,246 and per capita state and local general sales and gross receipts taxes peaked in 2006 at approximately $1,214. The Census Bureau defines “general sales and gross receipts taxes” as taxes that “are applicable with only specified exceptions to all types of goods and services, or all gross income.” Taxes that are targeted at specific items such as alcoholic beverages, amusements, insurance, motor fuels, amounts bet at race tracks, public utilities and tobacco are not counted. Property taxes, according to the Census Bureau, are taxes “conditioned on ownership of property and measured to its valued." They include taxes on real and personal property, including motor vehicles.